To make yogurt, you need yogurt. What if you have no yogurt? Ask your neighbor. Like a candle can light another without losing its own flame, fermentation too is a neighborly process. You also need a warm place. What if it is cold?? Here we will give not a philosophical but a practical answer. Warmth is the key to perfectly set yogurt every time! First, in case you are new to making yogurt, here are the simple steps to make yogurt at home. Allow to cool until it is still quite warm but not too hot. Test the temperature with your finger. It should be very warm, but not uncomfortably hot. Add yogurt. Use the more liquidy part – the whey. I usually add 2-3 spoons. I find this varies regionally. In India I could get away with only half a spoon but in the US I find it better to err on the side of too much. Even up to 1/4 cup is okay, though usually not necessary. Keep in a warm place. Think of India in the summer. Or Arizona with some humidity added. If all conditions are right, the yogurt will set in 4 hours. If more than 8 hours have passed and it still has not set you can try to rescue it by putting it into warmer surroundings. The sooner it sets the milder its flavor is. If you like it tart you can leave it longer but eventually you should put it in the fridge. It will gradually sour with each passing day, but much less than it would at room temperature. Now to the question: where do you get such a warm place if you are in a cold climate? People have come up with all kinds of techniques for keeping the pot of warm milk warm long enough for it to transform into yogurt. Some keep it near the radiator or heating vents, some keep it in the oven with the pilot light on. I used to turn the oven on for 1 minute, then turn it off, sometimes putting a pot of warm water in the oven to add humidity. Some buy pots that can be set to a constant temperature of 110 degrees. While this is an ideal temperature, it uses electricity for hours. In this day and age, who wants that? A haybox – bamboo box lined with hay that is sewn in place using jute. బీరకాయ పీచు – ridge gourd fiber. Any insulated bag, supplemented with cloth or packing material to keep contents warm. 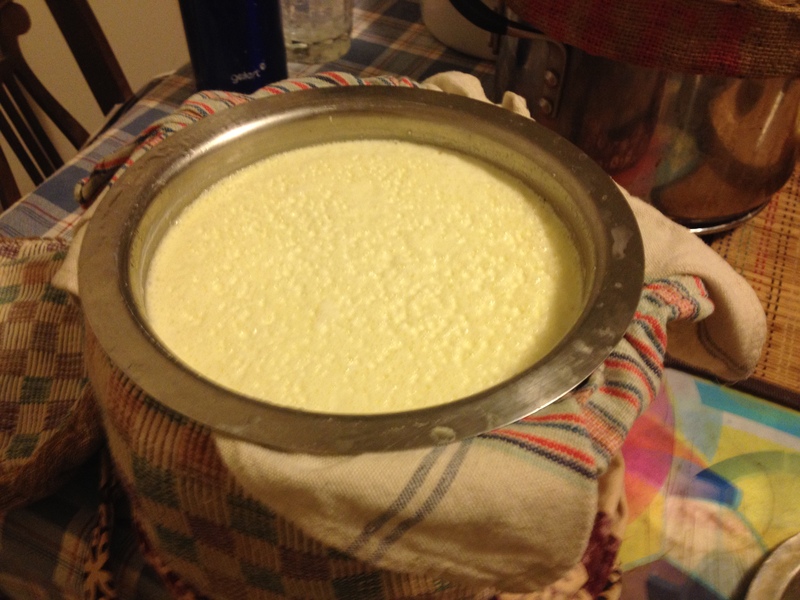 Look at this yogurt I made in January when the temperature in Maryland was in single digits – way below freezing! I love making my own yogurt.